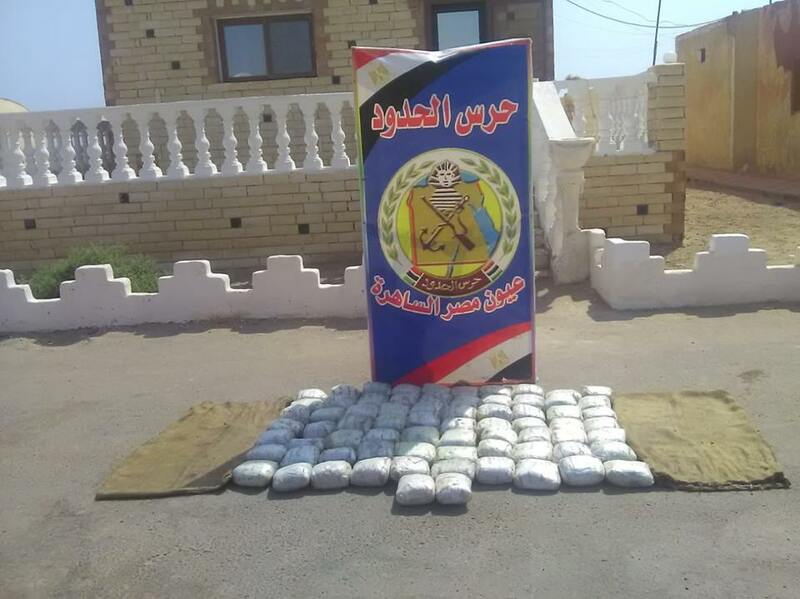 Egyptian Border forces have successfully foiled a drug smuggling attempted through the country’s southern border, Armed Forces spokesman Tamer al-Rifai said on Monday. The border guards acted on intelligence that drug kingpins were seeking to smuggle kilos of heroin using an automobile through the southern borders. The guards detained the smuggler and 72 kilograms smuggle heroin at the border. Rifai referred this bust as the efforts exerted by the Egyptian border guards to thwart attempts by criminals, smugglers and drug dealers to harm the national security. Rifai stated that the border forces were informed smugglers would transfer a drug shipment. In the past month, border forces arrested 451 illegal migration and seized 1,800 kg of bango, 6 kg of heroin and cocaine and about 2 million narcotic pills and hundreds of illegal weapons. Egypt has developed into a hotspot for human and drug trafficking. In recent decades, the use of narcotics became an increasingly serious problem for sensitive Egypt region. According to Amr Othman, head of the anti-drug agency, as victims of the drugs are swiftly increasing because of the enormous quantity of illegal drug available in the market, the future of Egypt is in grave danger. As Egypt is fighting a domestic war, drug trafficking threatens the country’s development and provide enough resources/finances to the nation’s enemies like terrorists or extremists operating in the country. Egyptian law enforcement finds it challenging to fight two wars at the same time. Dismantling drug trafficking requires accurate intelligence, identification of drug trafficking, drug routes, money laundering and tracing it to criminal and terrorist activities. Egyptian government needs to discover an innovative forensic technology that provides authorities with the above-mentioned accurate answers and support them to minimize their effort toward drug trafficking. Egypt has a growing drug problem that officials are struggling to stem. In order to magnify the achievements of Egyptian law enforcement agencies is through providing accurate intelligence and leads at an appropriate time, Egyptian law enforcement needs to embrace the most powerful specific screening tool that is impeccably accurate, guaranteed 100% results, easy to use and learned and non-invasive technology developed by Brainwave Science and it’s called iCognative. iCognative is the only existing technology that can provide an accuracy rate of over 99% and determine precisely what the drug trafficker knows and produces an impeccably accurate intelligence such as location of cartel and drug kingpin, date and time of drug smuggling, quantity and type of drugs, identification of drug traffickers in the country and other vital information from the best source of all action- the human brain. The problem with complex organized crimes is that the law enforcement is too quick to celebrate apprehensions and convictions of foot-soldiers whereas the kingpins are still free. Therefore, like metastatic cancer, the problem stems up and resurfaces over and over again. iCognative by Brainwave Science empowers law enforcement to reverse-engineer the whole gangs and drug networks, thereby elimination of the root cause of the problem is now a possibility. A iCognative test when utilized by Egyptian law enforcement agencies can identify with over 99% accuracy the drug trafficker or drug users from the innocents within an hour. This technology is so powerful that it can accurately reveal incriminating information connected to drug trafficking and other previous crime and match testimonies of suspects with ready intelligence available. The iCognative technology guarantees positive results with impeccable accuracy levels as the testing involves no question answer, no false positives or false negatives and minimal human intervention, therefore, it is the sole existing technology that is virtually unbeatable. By utilizing Brainwave Science’s groundbreaking iCognative technology, Egyptian border forces and law enforcement agencies can identify the drug traffickers in 45-minutes and obtain critical information about the drug rings. iCognative enhances the arsenal of any law enforcement agency looking forward to swiftly identify the perpetrator in a cost-effective and efficient manner. With intelligence provided by iCognative, law enforcement personnel shall be successful in removing drug traffickers from the streets, identify them and protect the youth of the country.